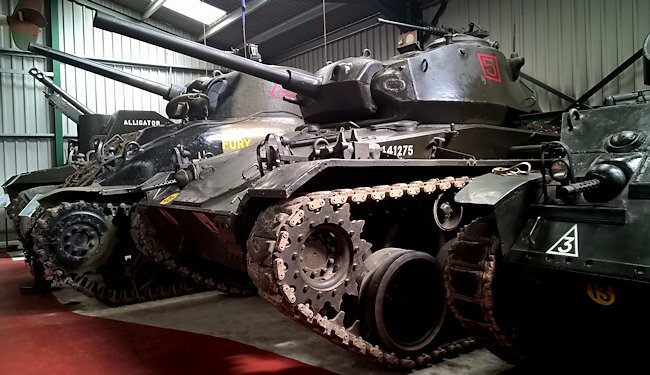 There were a few Chaffees in British service, supplied by the United States in 1945 and they remained in service for a short while after the war ended. The M24 Chaffee light tank was not extensively exported under the lend lease program because production only started in 1944. The only significant recipient of this tank was the British Army. They had ordered 842 vehicles but received between 203 to 302 in 1944 and a further 99 in 1945. The M24 Chaffee light tank was a replacement for the M5 Stuart. It was powered by two Cadillac series 44T24 8 cylinder engines that produced 110 hp each. 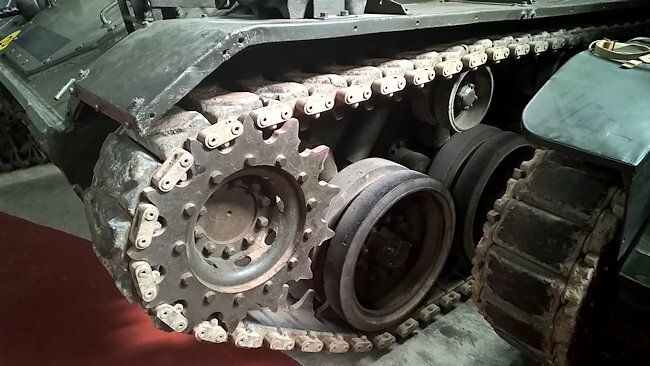 This gave the tank a top road speed of 35 mph (56 km/h) and an off road speed of 25 mph (40 km/h). It had an operational range of around 100 miles (161 km) before the crew needed to refuel the Chaffee. Although it was a light tank it still had a crew of five: commander, gunner, driver, loader, co-driver/machine-gunner/radio operator. It was produced from 1944 to August 1945 and 4,731 were made. They were deployed in small numbers in April 1945 replacing the American built Stewart light tanks in the last few weeks of World War two. Units known to have them include the reconnaissance squadrons of the 7th Armoured Division (The Desert Rats). At least two of these tanks were lost in combat prior to the war finishing. 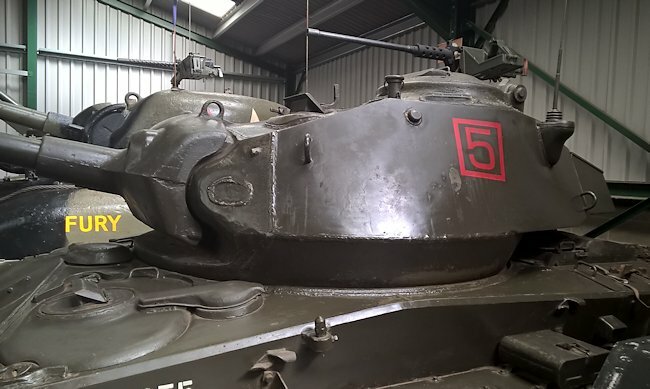 By June 1945 the 7th Armoured Division had an operational strength of 28 M24 Chaffee light tanks. By the summer of 1945 small numbers of M24 tanks were sent to Italy and India for training. The Soviet Union was also supplied with two tanks for evaluation in 1945. Most British M24s were given to the Dutch Army. There are a few survivors in the Barracks Museum in Amersfoort, The Netherlands. 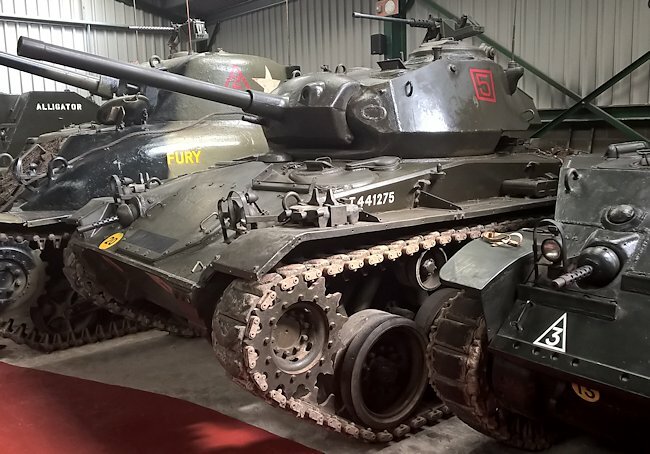 The Muckleburgh Military Collection in Norfolk, England has a restored working British M24 Chaffee, B Squadron, 1st Royal Tank Regiment, 22nd Armoured Brigade which was part of the 7th Armoured Division (the Desert Rats). 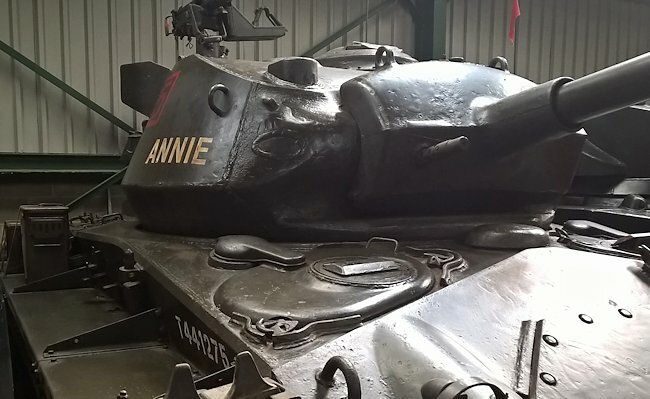 The number '52' painted on the front of the tank indicates the intermediate regiment in the Brigade, which by 1945 when they received a few M24s, was the 1st Royal Tank Regiment. The Red Stags head on a white background above the number 52 is the badge of 22nd Armoured Brigade. I think the Museum has made a slight mistake. Strictly speaking, the B squadron Red Square marking should be yellow. Red is for the senior regiment, the 5th Royal Inniskilling Dragoon Guards, who would have had the tactical number 51. The junior regiment, the 5th Royal Tank Regiment, would have had the tactical number 53 and its Squadron markings would be painted in blue. The large number 5 in the square indicates that the tank belonged to 5 troop. The M24 entered service with the US Army in winter 1944, during the Battle of the Bulge. One of the first units to get them was 740th Tank Battalion, which took over two M24s quite by chance during the ensuing 'flap'. The 740th was one of four tank battalions of the 9th Armored Group that had been training for the highly secret Canal Defence Light (CDL) role, a project to mount powerful searchlights on M3 medium tanks to illuminate the battlefield and blind the enemy. The project was abandoned later in 1944 and the CDL tanks put into storage. 740th were due to be converted back to a standard tank battalion, but at the time of the German offensive in the Ardennes had not yet received any Shermans. On 18 December 1944 they were ordered to bolster up a task force in the defence of the main First Army Ordnance Depot at Aywaille, which was under the command of Col. Lynde. When the CO of the tank battalion reported to him and explained that he had no tanks, Lynde ordered the Ordnance Vehicle Park to issue to the tankers 'anything the men could drive or shoot'. They found about fifteen medium tanks and worked all night making them combat ready. The next morning they also acquired an assortment of tank destroyers, assault guns, light tanks (including the two M24s that had just arrived from the States). Here is how their battalion history, written by Lt-Col. George K Rubel, recalls the incident under a chapter entitled 'Von Rundstedt's breakthrough battle of the Ardennes'. It wasn't definitely known how wide the break-through was because communication had been out in a good many places. Part of this communication tangle was caused by the over-running of unit Command Posts (CPs). The rest of it had been caused by German paratroopers who had been dropped in the rear. Col. Cox stated that the General wanted us to send a reinforced company to protect Ordnance installations in the vicinity of Aywaille, Belgium, which was located on the Ambleve River 8—10 miles SW of Spa. This company was to move as quickly as possible to Sprimont, Belgium, an Ordnance Vehicle Depot, draw any kind of combat vehicles we thought it could use then take up stations where it could delay the enemy. I had alerted the Battalion the night before on suspicion. I had felt sure that we would be used somewhere and that we would have little time to prepare for a move. Company C was to be the first company to move out, followed by A, B and D. The Service Company was to move out later ... I left at 1400 hours with Lt William S Wright, Liaison Officer and two recon Peeps … I reported to Col. Lynde, First Army Ordnance Officer, who had been charged with the defense of the Ordnance Depot. An enemy armored task force was advancing west along the River and was less than 12 miles away, so it was decided that as soon as C Company could be equipped with combat vehicles it would take up a defensive post east of Aywaille in the vicinity of Remouchamps. I made a quick reconnaissance of the area we were ordered to defend and then went over to Sprimont to arrange to draw tanks. 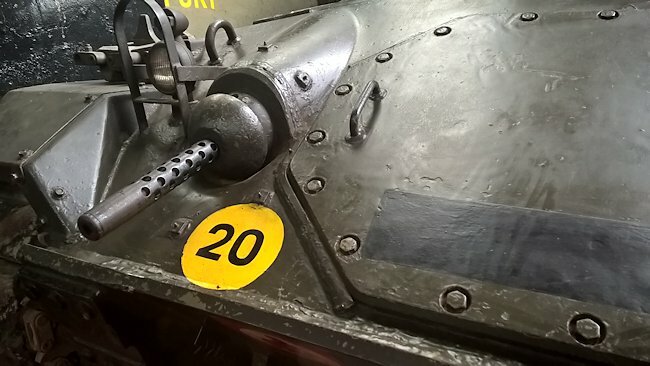 I was shocked to find that only three Shermans were on the ready for issue line and that these three were short of several essential items of equipment. The job of this Ordnance unit had been to repair and recondition tanks that had become unserviceable in combat. Of about twenty-five tanks in the park, only fifteen could be made operable. Even these had been cannibalized to some extent. 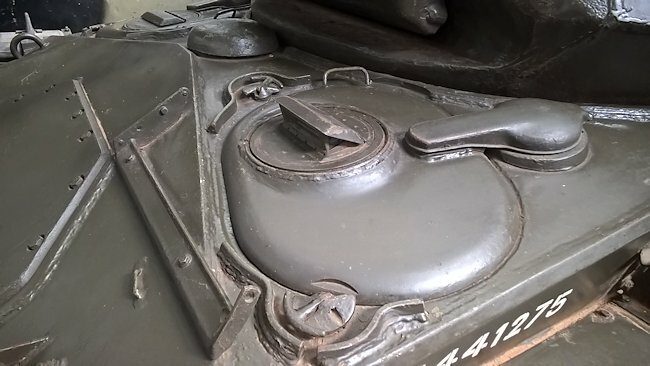 Generators and starters had been removed from engines, breech parts had been removed from guns, radio transmitters and receivers were absent, not to mention tools, rammer-staffs and other items. None of them had their combat loads of ammo. We had blanket orders from Army to take anything and everything we thought we could use. We picked out fifteen tanks that appeared to be repairable and worked all night and up until noon the next day robbing pieces from other tanks to put the ones we had selected in running condition. The tactical situation was going from bad to worse and at about 1800 hours on the 18th I decided to order the balance of the Battalion to move to Sprimont on my own initiative. They moved out at 1020 hours on the 19th. The Service Company took over the ordnance plant at Sprimont and the Battalion CP was established there. The combat vehicle situation looked a pretty hopeless mess. We assigned a tank crew to any vehicle that they thought they could put into operation. For instance, Sgt Loopey and his crew found an M36 tank destroyer and other tank crews took over MIO assault guns. The light tank company found two brand new M24 light tanks that had arrived in First Army area through error, and seven M5 light tanks, but had to fill up the rest of the company with M8 assault guns with 75 mm pack howitzers. The assault gun platoon drew M7 105 mm assault guns. Very few of these vehicles had radios and the platoon leaders found it necessary to use hand signals for control. By noon of the 19th Capt Berry (who commanded C Company), had two 5-tank platoons in position at Remouchamps ...About this time the S-2 of the 119th Infantry Regiment of 30th Division came by, enroute for his Regimental CP at Stoumont. He told them that his Regiment was in a desperate situation, with one battalion completely overrun and destroyed. The other two were down to less than half their effective strength and were being pushed back slowly. He pleaded for tank support but of course the CO of 740th was powerless to help. Later in the afternoon he returned with Gen. Hobbs, CG of 30th Infantry Division, who said that he had talked to Gen. Hodges and had got authority for the battalion to be attached to the 30th Infantry Division and that he in turn was attaching them to 119th Infantry. He ordered them to move out immediately with everything they could muster to help the situation out. Col. Rubel's account continues: 'We encountered sniper fire from the ridges paralleling the Ambleve River two miles before we reached the Regimental CP. Upon arrival we found that the enemy was less than 500 yards away. As I arrived, a tank company which had been supporting the 119th were withdrawing from the fight, stating that they were low on fuel and ammo. They also stated that at least five Panther tanks were coming this way and were only about 1000 yards down the river. The tankers said that the infantrymen were beginning to move back. 'Capt Berry, leading his tanks in a Peep, arrived at 1530 hours and we outlined the situation. He was ordered to attack at once before the Infantry were overrun completely. Lt Powers was to spearhead the attack with his platoon, and Lt Oglensky with his platoon was to follow. We advised Lt-Col. Hurlong, Battalion Commander of the 1st Battalion of the 119th Infantry that we were coming in to help, — that we would commence our attack at 1600 hours, and asked him to attack abreast of us as we came into his position. Lt Powers spearheaded the attack. He had gone scarcely 800 yards when he saw a Panther tank about 150 yards ahead at a curve in the road. His first shot hit the gun-mantlet, ricocheted downward, killed the enemy driver and bow-gunner and set the tank on fire. Powers kept on moving and about 100 yards further on came upon a second tank. He fired one round which hit the Panther's front slope plate and ricocheted off. His gun jammed and he signalled Lt Loopey (then Sgt Loopey) to move in quickly with his TD. Loopey's first round with his 90 mm gun set the tank on fire, but he put in two or three more shots for good measure. By this time Lt Powers had cleared his gun and had resumed his advance. About 150 yards further on he came upon a third Panther. His first shot blew the muzzle brake off the Panther's gun, and two more shots set the tank on fire. All during this action, which occurred within 30 minutes after the attack had started, a slow drizzling rain was falling, and a blanket-like fog covered the whole area. It was difficult to see an object 400 yards away. Lt Power's platoon had not only knocked out three tanks that had been raising hell with the Infantry, but his machine-guns had sprayed the roadsides as well as the sides of the hills and quite a number of enemy soldiers were killed. Our success in 30 minutes of combat had greatly heartened the doughboys of the 119th. They not only stopped giving ground but joined in the attack and recovered better than a thousand yards of terrain they had lost during the day. Von Rundstedt's thrust had been definitely stopped and hurled back in these 30 minutes, and it was the first good news that had come out of the entire Battle of the Ardennes up to this time. Unfortunately Col. Rubel's account does not specifically say what part the M24s played in this or subsequent actions, but one can be sure that the 'Daredevil Tankers' of the 740th (the name was their battalion code name) made full use of them.